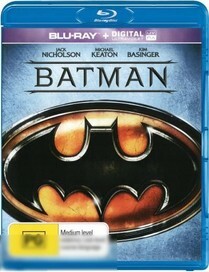 Synopsis: Tim Burton's direction and Michael Keaton's performance combine perfectly in this first film to capture the sinister atmosphere of Gotham City and the brooding nature of Batman. Jack Nicholson almost steals the movie as the maniacal Joker and Kim Basinger is Vicki Vale, the beautiful and resourceful photojournalist desired by both men. Featuring songs by Prince and a score by Danny Elfman, Batman won the 1990 Oscar for Best Art Direction/Set Decoration.